Let’s start by recognizing that in education, we take great ideas and processes from the private sector, and sometimes misapply them. Many years ago, the business community recognized that workers have great ideas and innovations that bring results and by sharing them with others, the organization grows and improves. In education, we have attempted to translate this idea into getting teachers to share “best practices.” But what we failed to do was the critical. Knowledge Transfer is a process that ensures that we first identify practices that indeed produced results, in this case improved learning, not popular experiences, or favorite lessons. 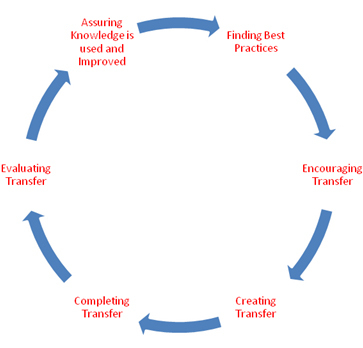 The general principles of knowledge transfer include the following. Click on the selected topic on the wheel to access useful websites on this topic or download forms to use in the process. Improving Your Daily Practice: A Guide for Effective School Leadership.